Vibrations beyond the permissible limit will be a major reason for the breakdown in any machine especially air compressor. It is important to protect your compressor from excessive vibrations developed due to the operation or any other reasons. Unfortunately, many plants are not using the safety switch on their compressor. If you are using or interested to install Excessive Vibrations switch, this post will help you to increase your engineering knowledge. Many different Vibration Switches are available in the market but in old days a very accurate switch “Robertshaw” made in the USA make VIBRASWITCH is adopted by various plants. You will find all the details about this vibrations switch here. The switch is to protect the crankcase/crankshaft against any damage from malfunctions that can be detected as an increase in vibrations. This is mounted on crankcase of a compressor. 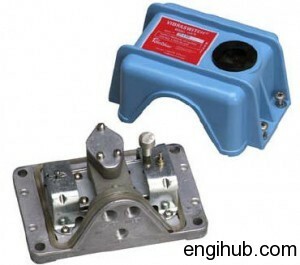 It is sensitive to vibration in the direction perpendicular to its mounting base. It contains vibrations detecting mechanism, which also functions as a “Mechanical Amplifier” to activate a snap-action switch when the selected level of vibrations is exceeded and the detecting mechanism “Trips”. The mechanism may be reset manually, by depressing the reset button to make the armature away from latching magnet until it is held against the stop pin. Adjustment of the operating set point. The operating set point for the “Vibra-switch” varies with the type of Air Compressor & its location on the machine. The set point adjustment suggested here are for a machine which is working in good or normal condition. The switch is adjusted by three-step procedure, for making the adjustment; cover must be removed to gain access to the set point adjustment screw. When the compressor on which the Vibra-switch is mounted, not operating, back-off the set point adjustment screw counterclockwise two turns & press the reset button. Then turn the set point adjustment screw slowly clockwise until actuation occurs. This is the zero vibration point or actuating point when the compressor not in running condition. A mark should be made to permanently record this “Zero Vibration point”. Subsequent measurements are made relative to this point. When the compressor is in operating condition, back from the set point adjustment screw one turn counterclockwise and reset. If it will not reset, back-off slowly until reset. Again turn the set point adjustment screw slowly clockwise until actuation occurs, mark the position. Rotate the set point adjustment screw one full turn counterclockwise from the point where actuation occurred in above step 02. NOTE: -Use Ohm meter to observe the actuation of the Vibra-switch visually in noisy surroundings.